Beware Ministers bearing data. Particularly if they’re using it to defend the government’s track record on how Auckland First Home Buyers (FHBs) are faring. Two instances involving Building & Construction Minister Nick Smith and Prime Minister Bill English caught my attention this week. Arguments used in support of greater affordability and government measures to help first home buyers need clarifying. The first was during Smith’s interview on Radio NZ Tuesday morning regarding Auckland’s Special Housing Areas. Presenter Guyon Espiner threw Auckland’s median house price at him - $865,000. The Welcome Home Loans scheme is a key part of the current government’s ‘affordable housing’ package. It allows banks to shift the risk of default onto Housing NZ’s balance sheet for mortgage customers they wouldn’t otherwise lend to. But there are some checks in place to try and ensure it doesn’t get too out of hand. One of them is a house price cap. You can’t access the Welcome Home Loans scheme if the house you want to buy costs more than the regional cap. In Auckland, it is $600,000 for existing properties, and $650,000 for new properties. You can’t buy a median-priced house in Auckland using the Welcome Home Loan scheme. For Smith to suggest the scheme could help someone in that situation is simply wrong. In fact, you can’t even buy a lower-quartile house in Auckland with help from the Welcome Home Loan scheme – in May that came in at $655,000. That’s ridiculous. And lower quartile pricing is what I want to discuss next for the second instance of concern. In defending its record on housing affordability, the government has been turning to the most recent Massey University Home Affordability Report as showing affordability is better in Auckland than 12 months ago. Disclaimer: Interest.co.nz has a competing affordability publication – our Home Loan Affordability Report. Now, the Massey report is released quarterly (the last one used February figures) and, importantly, uses median house prices. The problem I have is that comments from Ministers referring to the Massey report are often in response to questions about affordability for First Home Buyers, particularly in Auckland. Do not listen to them if they wheel this one out. As part of Interest.co.nz’s Home Loan Affordability series, we run a First Home Buyer report. And we don’t assume FHBs are trying to buy a median-priced house. We estimate the proportion of take home pay required to service a mortgage that has been used to buy a lower-quartile house by a couple aged 25-29 earning the median wage for their age group. It’s not an exact science. But the latest figures show that in May, such a couple would have required 45.2% of their take home pay to service their $591,679 mortgage. That’s up from 40.3% a year ago. First Home Buyer loan affordability in Auckland is worse than it was a year ago. Don’t just take our word for it on using lower quartile prices. Nick Smith’s own Building & Housing officials within MBIE agree. When developing their Housing Affordability Measure (HAM) with Stats NZ, MBIE decided that first home buyers typically purchased “modest” dwellings. Now, MBIE uses Corelogic data rather than REINZ. That’s fine – it’s nice they’re allowed access to it. The bureaucrats also have free access to various Stats NZ ‘IDI’ address data and IRD income data which we don’t have. In theory, theirs should be the gold standard first home buyer affordability measure. In practice, they botched the release, used the wrong mortgage interest rate and the results had an 18-month lag. We’re told it will get better. Perhaps to a six-to-nine-month lag. Hallelujah. This means Nick Smith cannot turn to his own Ministry when defending the government’s track record for Auckland First Home Buyers, unless he wants to talk about how it got worse between 2013 and mid-2015. On the flip-side, it puts Ministers in the position to pick and choose how best to defend their track record on Auckland First Home Buyers. 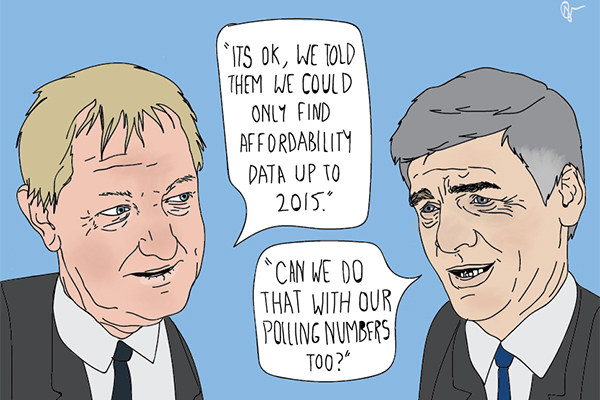 Beware Ministers bearing affordability data. This is nothing but making fun of first home buyer by government. Rubbing salt to wound. Nick Smith would have no place working in the private sector running data- or evidence-based solutions to build business cases, particularly if the business he were involved with had to require on efficiency and innovation to turn a buck. He has forged his career in the right arena to get away with this malarky. Hell, a current catch phrase in the business is "big data" and all the govt / bureaucrats can manage is perform in a Kafkaesque manner. Smith should take some responsibility: either quit or stop behaving like a 2nd-rate apologist. One thing is for sure: he disproves the oft-used argument "MPs need to be paid highly because people of their caliber could make far more money in their private sector". I think they use a different tactic by stating, "we're not in it for the money." That's somewhat true: at a cursory glance, salaries do not match top salaries in the private sector. The real crux is that most of them would not be able to command a top-level salary in the private sector, unless it was a monopolistic / oligopolistic organization (energy for example) or some kind of institutionalized organization that is granted privilege (banking, finance). I started writing some text about the believability of the two mentioned then stopped. Its all been said before. They should just avoid the media and fade away ungracefully. Hopefully will fade away after 22 Sept.
Bolton said the typical first home buyer that could afford the Onehunga property would be a professional couple without children who had perhaps come back from working overseas and had a decent deposit. Stop. Stop with the word games. Stop changing the labels and stealing labels to cover the issue! Auckland will just fester more as these word games continue! Auckland will continue with poor housing outcomes, as folk keep changing and wriggling words and using dumb definitions to describe the poor outcomes! Your job in New Zealand is NOT GOOD enough! "snap" and you're back in the room! The government isn't interested in evidence. They learned from Dame John Key that it's perception that counts, and it's politically expedient to wave difficult evidence away. They're not called these here, but we have a government dealing in 'alternative facts', whether in housing, water quality or a host of other issues. Good on 'interest' (and National Radio), both rare in NZ media, for digging through to realities. Beware interest.co.nz editors bearing anything positive about anything. Please explain or give examples. I agree with you. Interest.co.nz is a fantastic resource. The editorial team are competent and insightful as well. Don't forget the David will challenge incorrect assumptions as well. He even goes out of his way to provide statistics to back his position. Trademe in Pakuranga has a 3 bedroom home for $750k, any normal hardworking single, couple or family could save a deposit (10-15%) with help of Kiwi saver and buy this property, unless of course they are a contributor on this forum as auckland is basically incompatible with life in their thinking...try putting some adult shoes on with laces and buying something in other world cities for that kind of money. The constant reference to the WHL scheme as if its a Good Thang neglects the baleful economic effect it actually has on building new (and selling old, probably). "Why, given a $650K (new) or $600K (used) loan availability, would anyone Build or Sell a house for less than that figure?". WHL, as a loan scheme, has one core criterion: 'Can you Fog a Mirror?' - so it is theoretically available to all: it is Universal. In economic pricing terms, the WHL loan figure is a universal pricing signal. If a building materials or fuel supply company claimed that 'we can't sell Gib or diesel for less than $x because that's wot the Gubmint will give us for them poor people' then ComCom would jump on them quick smart, alleging non-competitive behaviour. They would be expected to provide volume discounts, show that they did not collude or price-fix, and generally act competitively. Yet, strangely, in Housing, you'd have to have rocks in your head not to quote a new build for house+plot at $650K plus, in Awkland. Everyone agrees that first home buyers are locked out - regardless of what statistics the Minister quotes. But affordability's not just an issue for first home buyers - it's every home buyer's issue. Home owners are increasingly priced out of the next rung on the ladder, despite the capital gains on their existing property. Is Labour offering anything different ? The elephant in the room which most people seem to be ignoring here is the massive number of immigrants being allowed to flood into this country. The Government actively encourages it. Nearly all our problems, such as housing, roading, hospitals etc can all be attributed to this immigration , the likes of which we have never seen before. The only party that has a genuine policy to put the brakes on is NZ First. I do not like them but they are the best of a very bad bunch!